Alexandre Dumas was born July 24, 1802, at Villiers-Cotterets, France, the son of Napoleon's famous mulatto general, Dumas. Alexandre Dumas began writing at an early age and saw his first success in a play he wrote entitled Henri III et sa Cour (1829). A prolific author, Dumas was also an adventurer and took part in the Revolution of 1830. 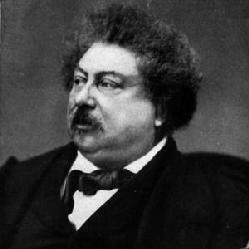 Dumas is most famous for his brilliant historical novels, which he wrote with collaborators, mainly Auguste Maquet, and which were serialized in the popular press of the day. His most popular works are The Three Musketeers(1844), The Count of Monte Cristo (1844-45), and The Man in Iron Mask (1848-50). Dumas made and lost several fortunes, and died penniless on on December 5, 1870.